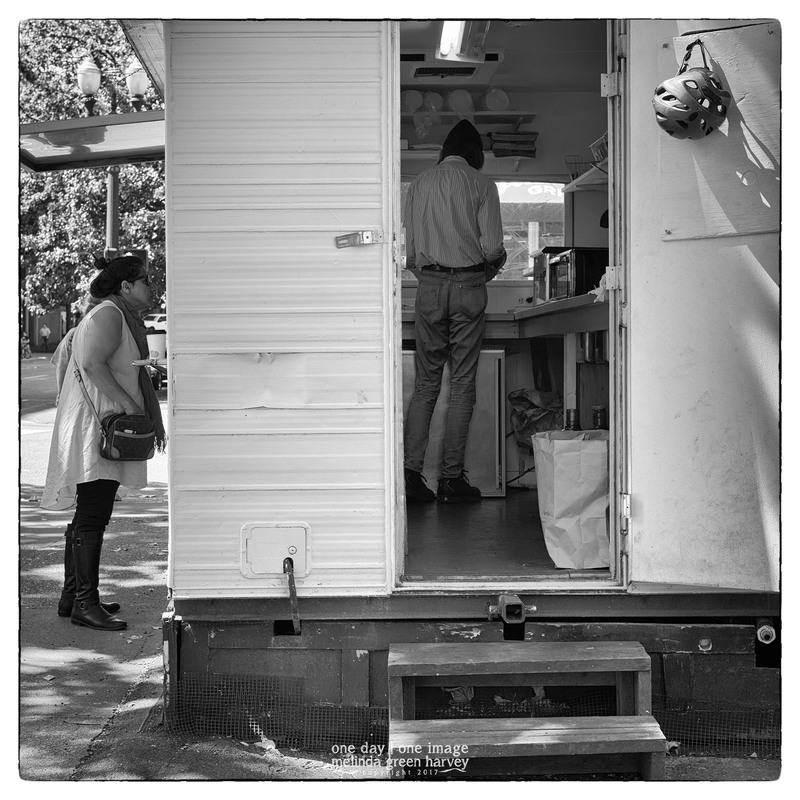 A woman carefully considers her lunch choices, while the man inside works on another order. Posted on January 26, 2017, in Photography and tagged 365 photo project, black and white photography, downtown, melinda green harvey, monochrome, NIK Silver Efex Pro 2, one day one image, PDX, photo a day, photography, Portland Oregon, postaday, street photography. Bookmark the permalink. 10 Comments. Somebody rides a bicycle it appears. Place doesn’t look very busy to me. It’s Portland. Everyone rides a bike. Or at least hangs a bike helmet on the door so it LOOKS like they rode a bike. I wonder how many times has that guy tripped on the trailer hitch I wonder. He’s probably got permanent bruises! Bruised head from pounding it on the wall trying to sort out the grammar in my question! It didn’t seem all that much un-grammar-ey to me. But what the hell do I know? I just said “un-grammar-ey” (after a short debate with myself if that “e” was necessary or not). I think that grammar might be redundant in that context. You could get away with “un-ey” if minimalistical-ey ( should I say “-ey”?) inclined. I’m getting dizzy from all this alternative grammar. But I guess I need to get used to alt-everything. Yes, like your alt-guestroom, over at Mary’s.